Welcome to the start of a new series of articles, The Frugal Gamer, where I’ll examine the costs of various aspect of the hobby. Today we’ll be examining the starting point for a number of miniatures games, so you can make an informed decision on which one(s) you want to jump into and how much that’ll set you back. I’m also going to be using American prices, since that’s where I’m situated. Prices in your region might vary a bit. I’ll be using retail prices, which means some of these items can be found cheaper if you shop around. 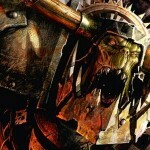 Let’s start with the big dog first, Games Workshop. Their latest game is Age of Sigmar, a game that you might have heard is pretty easy to get into. That’s not inaccurate. You can grab a free copy of the rules and warscrolls for armies that existed in Warhammer Fantasy Battles (Games Workshop’s fantasy game prior to Age of Sigmar). For newer factions, you can get rules by going to a unit’s listing on the Games Workshop web store and looking for the “Rules” tab in the description area of the page. This means there’s no cost for rules, unless you want to get specialized formations or scenario rules. Those are more advanced options, so not to be considered here. For getting started with an army, Games Workshop has released a few handy “Start Collecting” boxed sets. One option that might be attractive given how the forces of Chaos star as the bad guys of the setting would be Start Collecting! Slaves to Darkess, which includes a Sorceror, five Knights, twelve Warriors, and a Chariot. If you’re more interesting in fighting the forces of Chaos, you might try Start Collecting! Seraphon, which includes a Saurus Oldblood on Carnosaur (which can also make a Scar-Veteran on Carnosaur, or a Skink Oracle on Troglodon), eight Saurus Knights, and twelve Saurus Warriors. Both sets come in at $85, so you can easily get started by just dropping that on an army. There’s also the Age of Sigmar starter set, which includes Stormcast Eternals and Khorne Bloodbound forces, as well as dice, measuring sticks, and a printed book containing rules for the units and background for the game. That set comes in at $125. On the other side, Games Workshop has Warhammer 40,000. Your quickest option for getting started with a friend, if you’re interested in the included factions, is to pick up the Warhammer 40,000 Dark Vengeance starter set for $125. This will give you a rulebook, templates, dice, and a starting force of Dark Angels and Chaos Space Marines to build on. To play outside of the confines of the starter set, you’ll need army books for the included factions, Codex: Dark Angels at $58 and Codex: Chaos Space Marines at $41. If you go the route of a Start Collecting set for Warhammer 40,000, you’ll also need some basics. You’ll need a copy of the Warhammer 40,000 rules for $85, and, depending on whether you use certain weapons, you might need a set of Universal Templates for $13.25 and/or a GW Dice Cube for $8.25 (which includes special dice for scattering, as well as 25 small d6’s). Over time, you’ll definitely find yourself needing the templates and dice. Now we move over to Privateer Press, Games Workshop’s longest competitor, and another well known company. 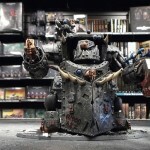 Their options for fantasy skirmish combat include the steampunk-esque Warmachine and the more basic fantasy of Hordes. Both Warmachine and Hordes have their rules available as a free download, and models come with cards that include their rules, so buying books is purely optional. The easiest way to get started with a friend in Warmachine is to get the Warmachine Two Player Battle Box for $100. It includes two starter forces, a small rulebook, dice, and some very basic templates. If you want to go with a different force, you can get a faction starter set, all of which come in at $50 and are designed to be ready to play. Hordes similarly has the Hordes Two Player Battlegroup Box for $100 and faction starter sets for $50 each. For either game, you can get a set of sturdy plastic templates for $10, which is highly recommended. Mantic is relatively new to the scene and slowly building a name for itself. Its most popular miniatures game, with the biggest available line, is Kings of War, a game of ranked fantasy skirmish. For Kings of War, you’ll need a copy of the rulebook. While you can get a copy of the Gamer’s Rulebook for $25, I’d recommend getting the full rulebook for $40. For $15, you’re getting a number of army lists, plus a sturdier hardcover. Unless you’re going for an army covered in the expansion Uncharted Empires (which Mantic doesn’t have model ranges for yet), you’ll need those army lists to build an army. Kings of War has a Mega Two-Player Set for $175, which sounds a bit high for a starter set, but it includes the rull rulebook, the Gamer’s Rulebook, a bunch of counters, arc of sight template, small ruler, turn counter, 80 Undead miniatures, and 66 Dwarf miniatures. So you’re getting a pair of reasonably sized armies and all the counters and rules you need to play the game. Kings of War also has a number of Army and Mega Army sets for their various factions, prices at $85 or $175. 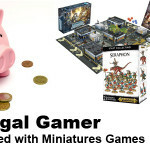 An $85 force will easily get you by for small-to-moderate sized games, and a mega army, which in some cases can include over 150 miniatures, will have you set for large games. Warlord Games is getting to have a pretty impressive range of games and miniatures covering all sorts of periods. I’m only going to focus on Bolt Action, their World War II skirmish game, and Beyond the Gates of Antares, a sci-fi skirmish game. Bolt Action has its own starter set, the D-Day Firefight Starter Game for $112. You’ll get a rulebook, a couple of small starter forces (20 infantry versus 12 infantry and a half-track), a bit of terrain, a couple rules, scenarios, pinning counters, D6’s, and order dice for both sides. You can play such small games of Bolt Action, but those are more very basic starters for American and German forces. If you want to build up your own force, you’ll need to start with the Bolt Action Rulebook for $35. Then, for an easy all-in-one package, you can order a Getting Started Bundle for a selection of armies, which includes the force’s army book, a 1000 point army, and command dice, for $160. If you want more variety, you can pick up one of the army books for $25, and then snag one of the Bolt Action Army Deals. You can get a 500 point force for $59.20 t0 $86, 1000 points for $121 to $190, or 1500 points for $172.75 to $200. There’s 2000 point armies available, but they’re more in the $300 range. You’ll also need a set of command dice for your army, an extra $16. Beyond the Gates of Antares is a newer game, so there’s not as many options yet. It does have a similar Starter Set for $112, for small scale skirmishes with a friend. If you want to start without a starter set, you can get a BtGoA Rulebook for $48, a Concord Combined Command Starter Army or Ghar Empire Starter Army for $80 each, and some command dice for $16. Now we’re just going with game names, because it’s easier for people to relate to than company names (in this case, Corvus Belli). Infinity is a small scale near-future skirmish game that uses D20s. You can get the Infinity rulebook, unit and gear stats, and a lot of other stuff as free downloads from their website. Following the trend of the other games, you can get a starter box for Infinity, named Operation: Icestorm, for $120. Operation: Icestorm contains two forces (which are a reasonable size for playing the game), rulebook, dice, even scenery. If that’s not your thing, you can a specific faction boxed set to start with. For example, you can get the USAriadna Army Pack with a small force, rulebook, scenery, templates, dice, and counters for $120. You can get smaller sets with just miniatures, such as the PanOceania Starter Pack or Qapu Khalqi Sectorial Starter Pack, for $58 each, and then add on with blisters or other boxes. A starter set should be enough to get you going, though. Malifaux, by Wyrd Games, is a small scale skirmish game that sort of blends Victorian era, dark fantasy, and a bit of steampunk. Each box of miniatures includes rules cards and some upgrade cards for the included models. They also have some handy Resources, including a Crew Creator to help you plot out your crew before you buy (and build instructions, which are a very important bookmark). Of course, Malifaux has a two-player Starter Box. It has two crews of four models each, cards for the models, two Fate decks, a small rulebook (and digit rules manual), and two measuring tapes, for $65. If you don’t go with the Starter Box, you’ll need to start with a rulebook. You can get the Malifaux Rulebook with rules and background for $40, or the Rules Manual with just the rules and no background for $15. From there, you’ll want a crew set, like The Guild’s Judgement – Lady Justice Box Set at $45, or Troubleshooters – Ironsides Box Set for $45. You’ll also need an Arcane Fate Deck to play the game ($12). You can expand your options with Arsenal Boxes that are $8-$9 each and include additional upgrade cards, but those aren’t needed for starting out. I’ll have to admit I don’t know much yet about Wrath of Kings, but I’ve seen it popping up on shelves at the local game stores, and the models do look promising. It’s produced by Cool Mini Or Not, and you can grab a free copy of the rulebook (or buy the print version for $40, but we’re being frugal here, remember?). Wrath of Kings doesn’t have a starter box yet, but there are plans to release the Honor and Treachery 2-Player Starter Box on March 12, 2016, priced at $60. In the meantime, you can get starter boxes ($70), add-on boxes ($35), and character boxes ($25) for the various factions. A faction starter box should give you what you need to get started playing. Okay, it’s another “big dog.” Star Wars: X-Wing Miniatures (which shall hereafter be referred to just as “X-Wing”) is a game by Fantasy Flight Games using prepainted models, packaged in blister or box “expansions” that include the ship(s), cards for various pilots and upgrades, and appropriate tokens. While you can get the rules free online, I highly recommend picking up a copy of The Force Awakens Core Set for $40. It includes a pair of TIE/fo fighters and a T-70 X-Wing to get you started, but more importantly, it includes rulers, dice, terrain markers, and a damage deck. The rulers and damage deck are core to gameplay but only available so far in the core set. From there, you can easily build a starting Rebel squadron with an extra T-70 X-Wing for $15 and the Rebel Aces Expansion Pack for $30. This will give you a pair of T-70 X-Wings with a good selection of pilots, an A-Wing and B-Wing to add more versatility, and plenty of upgrade cards. You should easily be able to hit 100 points (the standard size for a game of X-Wing) with that, or even higher. For the Imperial side, you can snag an extra TIE/fo fighter for $15 and the Imperial Aces Expansion Pack for $30. You’ll have three TIE/fo’s with plenty of pilots to choose from, and a pair of TIE Interceptors, with a good selection of upgrade cards. With decent skilled pilots and upgrades, you’ll easily be at 100 points. Frostgrave is a small scale fantasy skirmish game by Osprey Publishing, based around a wizard, typically with an apprentice, and his band of soldiers and mercenaries trying to scavenge for loot in the city of Frostgrave. You can get the Frostgrave Rulebook for $25. From there… you can go anywhere. You can get official Frostgrave miniatures if you want. But you can also use models from any range. If you want to use Reaper miniatures, or pre-painted D&D or Pathfinder miniatures, you can. If you want to use a Games Workshop Empire Wizard and Free Company to make a Wizard, Apprentice, and selection of mercenaries, you can. You can use non-humans if you want. If you already have fantasy miniatures, you can probably already play Frostgrave. There are a lot of other games out there, and I might go into more detail on them later on, but they provide a nice selection of two-player starter boxes to get you on your way, and at the very least, those starter sets can provide some occasional breaks from your other games. Ever wonder what happens if you slap the Wild West with a stylized sort of steampunkish vibe? That’s what Wild West Exodus is about. Two forces, rules, all the usual trappings. Another of Mantic’s games, this time more sci-fi based. There’s two forces, rules, the goodies, plus card terrain and even a 2’x2′ gaming mat. Literally everything you need to play. Mantic again, this time with a violent sports game with futuristic look… similar concept to Blood Bowl. Two teams, game mat, all those goodies. Another miniatures game from Fantasy Flight Games, and with a similar style of core set and expansions to X-Wing, but you’ll need to paint these models. Spartan Games brings us this game of large-scale warfare using small-scale models. Also by Spartan Games, Halo: Fleet Battles is a game of fleet combat in the Halo universe. It’s still just starting, but the two-players starter set has plenty of ships to get going. Firestorm Armada: Return of the Overseers – $160ish? Yet another Spartan Games entry, this is a fleet battles game set in their own Firestorm universe (shared with Planetfall). Dropzone Commander Two-Player Starter – $90ish? One more large-scale battles game using small-scale models, this starter box also packs card buildings for terrain.